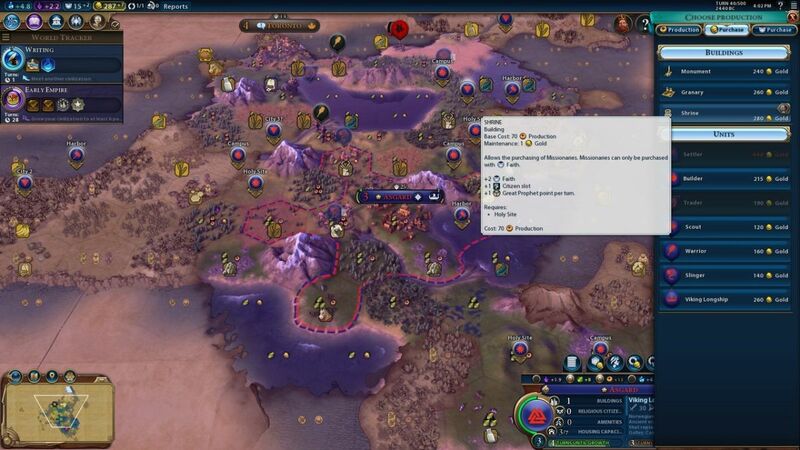 After the success of the initial Play By Email (PBEM) Civ6 game at Realms Beyond, several other games started up and attracted their share of competitors. The PBEM2 game proved to be particularly exciting, with Alhambram managing to sneak a Religious victory in semi-incredible fashion. As a quick recap of that game, Alhambram struggled in the early game before eventually managing to reach Russia's unique unit cossacks and run over his northern neighbor, Woden. The other three players in the game, oledavy and TheArchduke and Singaboy, had spent the whole game squared off against one another in a triangular three-way conflict that ultimately ended with TheArchduke's elimination and Singaboy reduced to a minor power. In the wake of that game, many of the same players decided to start up another new game with a naval focus to be played out on an archipelago map. Everyone other than Alhambram returned for this new game that turned into PBEM4, the subject of this report. I did not play in this game, but it proved to be such a compelling event that I wanted to chronicle it on my website, albeit not in the same level of detail as the PBEM1 game that I did with Rome. 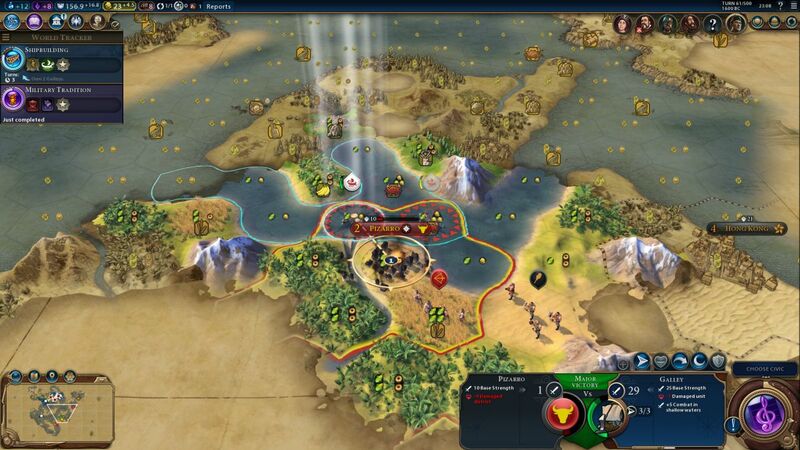 This was the first-ever game of Civ6 that I can recall that featured a heavy emphasis on naval combat, and it deserves to be archived here to show a side of the gameplay that few people ever get to experience. 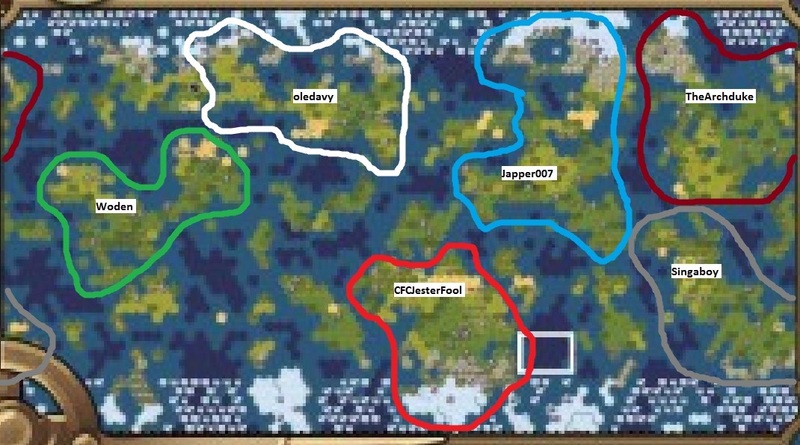 Each player had their own moderately-sized island to themselves containing a city state, with further islands containing additional city states scattered between them. The map wasn't perfectly symmetrical or intended to be, instead offering a roughly fair chance for each player to get ahead. This was enormously better than the results that we produced from rolling random maps, and there was widespread consensus from everyone asociated with this game that Cornflakes had done a fantastic job with the map. I listed the three different types of ships in different colors: red for naval melee units, green for naval ranged units, and then purple for the special naval raider units, which are essentially also ranged units but with their own separate upgrade path and different promotions. Melee and ranged units function exactly the same way for naval units as they do for land units, with melee units only able to attack units next to them and ranged units able to shoot from 2-3 tiles distance away. Naval ranged units are fully capable of shooting at units on land, and their high mobility on the seas makes them deadly weapons on archipelago maps. Keep in mind as well the upgrade paths between these units: galleys can be upgraded into caravels, which can be upgraded into ironclads, and so on. Access to the next tier of naval units would be critically important throughout this match. There's one other thing that I should mention about this game. PBEM4 used a public diplomacy thread, which meant that there was one stickied forum thread where all of the players could post whatever they wanted (in full view of the other players) and try to conduct diplomacy with one another. We pretty much stopped allowing diplomacy in our Multiplayer Civ games at Realms Beyond over the years because we found that it led to bad blood between players and poor outcomes from a gameplay perspective. Those of you who've read my Civ4 reports about the Pitboss #2 game might recall what a disaster the diplomacy turned into during that event. The problem with allowing diplomacy is that the discussions between players inevitably end up dominating what happens to a greater extent than what happens in the game itself. We want to play a game of Civilization here, not a game of "who can manipute everyone else the best." 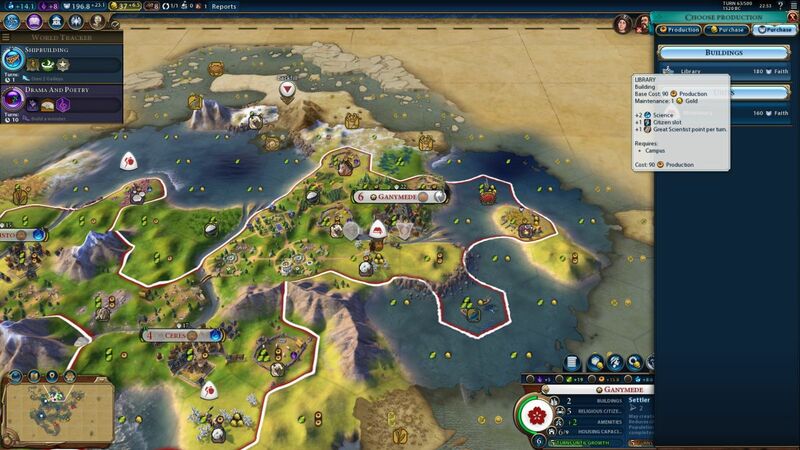 (There are lots of other non-Civ games that do that sort of thing better.) Diplomacy games frequently see losing players unite together and to dogpile the winning player, which might be realistic in some ways and certainly provides excitement for those reading about the games, but it tends not to be much fun and it punishes those who are actually playing the game well. We have switched instead to "AI Diplomacy", in which players can make trading offers to one another in-game but can't exchange messages. This system has worked much better in practice, avoiding the hard feelings between players and making it harder for different players to coordinate together. You can never really be certain if someone else is an ally in an AI Diplomacy game. But this game would be use the aforementioned public diplomacy thread, and that would have serious consequences on the results. I'm going to avoid discussing the diplomacy too much in this report, only mentioning the major results of the endless discussions that took place between players. oledavy: It's too early to settle upon anything solid at this point, but I think I want to emphasize districts this game and focus on my economy - playing to Japan's strengths. Ideally, I want to rush out to two cities early and quickly build/chop out a holy site in one and an encampment in the other. 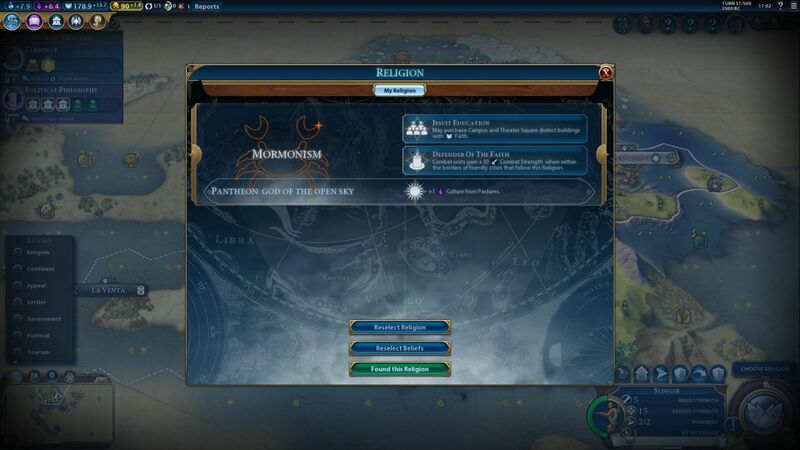 I'm already inclined to look into religion more this game after the experience of PBEM2 (I don't want to be dependent on anyone to prevent a religious victory). 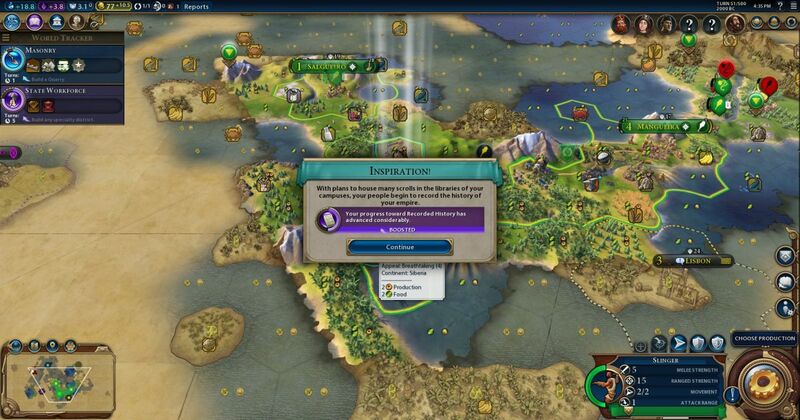 And, I benefit here as the only civ with a religious buff. While Spain benefits a lot from a religion, they don't get any buffs towards pursuing one. In that regard, I think I lucked out here as I effectively only have one competitor (and a crappy one at that). So, if I prioritize it properly, I should have no problems grabbing the first religion at a premium. And you can count on me taking Defender of the Faith. I will take being invincible for the rest of the game, thank you very much. I would also love to grab an encampment early. Not so much for the GG, as with island plates its pretty likely my nearest neighbor will be overseas. I want an encampment for the ability to upgrade with only one strategic resource. Not going encampment first nearly killed me in PBEM2, and I don't intend to repeat the mistake here. With iron and horse often hard to come by, you absolutely need to have an encampment so at the very least you can upgrade warriors. So, beyond a vague desire to prioritize two districts early alongside a long term interest in DotF, I don't have much else planned at present. We'll see what the map gives me! oledavy: I have room for 2 high quality cities, 3 decent quality cities, and 1 backfill city. City 3 has been moved inland to more effectively cram in districts and allow for a city west of it. It will need a bit of builder attention from the get go, as it doesn't have great first ring tiles. However, being inland will make it invulnerable to attack from the seas. So, this is the first sketch of the urban sprawl central hinterland I wish to build before the end of the game. First priority is going to go to getting out a couple Holy Sites and Commercial Hubs in Ceres and Ganymede, at which point I'll reassess and determine what needs to come next. This district plan gives me all of the districts I think I need for notable the Eurekas (2 Commercial Hubs, 2 Harbors, 2 Holy Sites, 2 Campuses, 1 Theater District). I will not be going for the Industrialization or Recorded History Eurekas, as both are just a little too inconvenient to land. I may yet reassess this dotmap and cram in an entertainment district, but it's hard to justify putting a district that gets no adjacency bonuses into the middle of all that. Finally, that IZ is positioned to open up the Venetian Arsenal for me. The colors above are designed to correspond to the respective district colors in Civ6: white for Holy Sites, blue for Campuses, yellow for Commercial districts, purple for Theatres, and then the teal color for Habors. 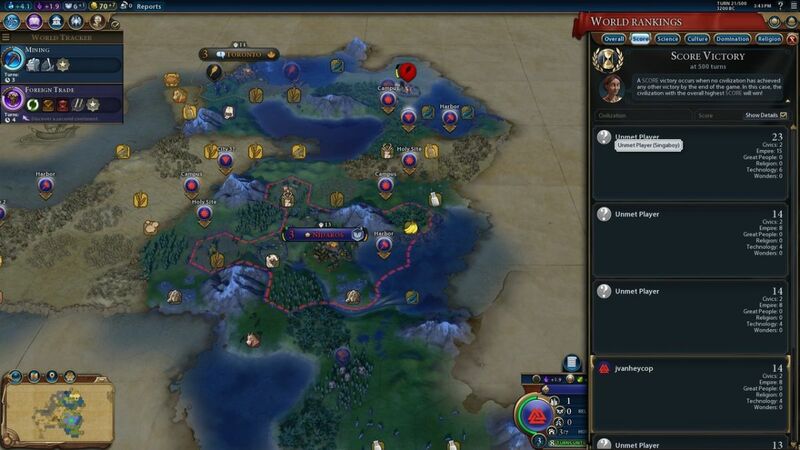 Japan's unique civ ability grants a standard adjacency bonus for each district of any type placed next to another district, and this becomes very powerful when combined together as oledavy outlined above. 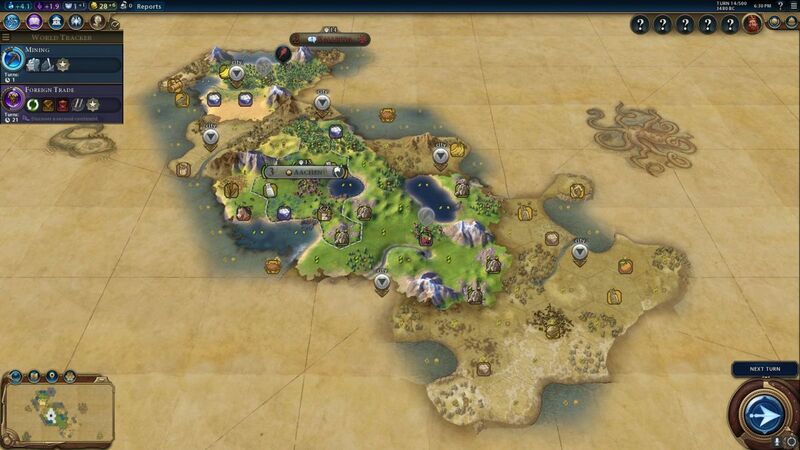 The one Campus district in the center would produce +6 science by getting an adjacency bonus from every single tile surrounding it, and that could then be doubled further with the National Philosophy policy card for +12 science from a single district with zero buildings completed! 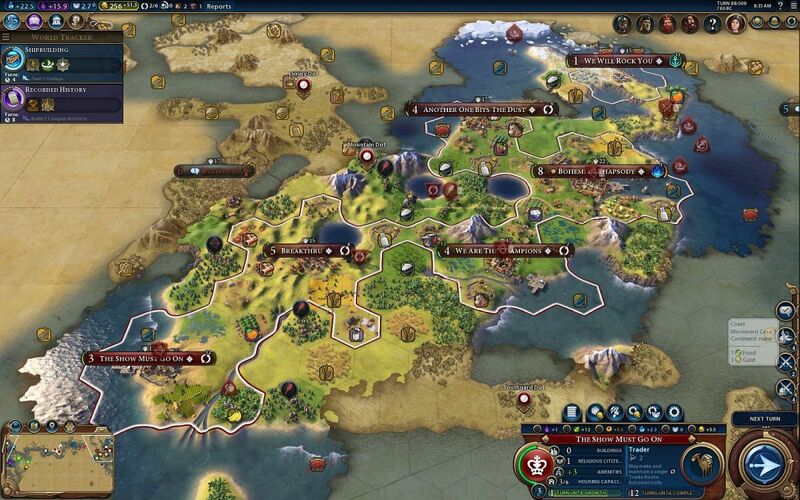 Of course, that required having all the other districts finished to get the adjacency bonus, but this was a powerful usage of Japan's unique civ ability. 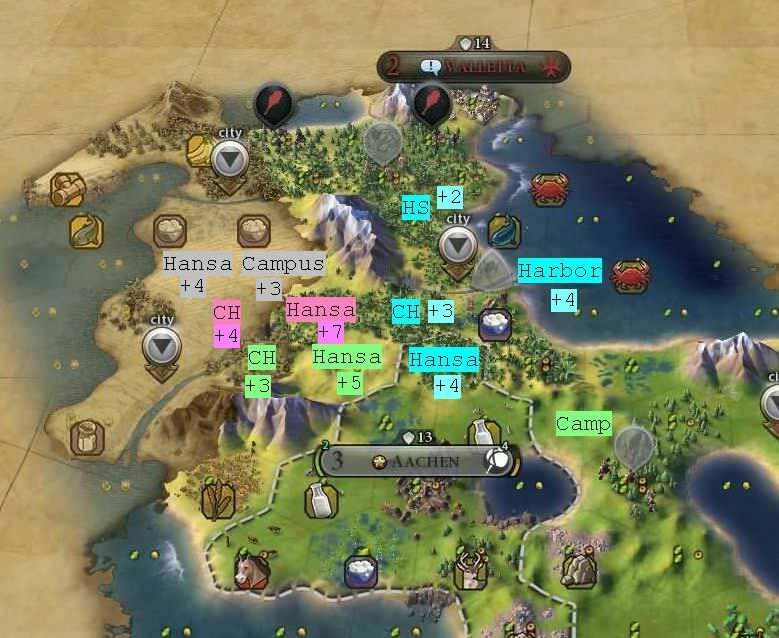 Combined together with cheap half cost Holy Site/Theatre/Encampment districts and Japan's +5 combat strength for all units next to or on coastal tiles, this was a strong overall package. Singaboy: District Planning in the north: To illustrate what should be possible with German's district power, I have labeled the northern 4 cities with color codes and the district bonuses they get from adjacent districts, resources, rivers and hills. I especially like the +7 Hansa, which gets its bonuses from three Commercial Hubs and two districts. Germany was producing 15 beakers/turn, 10 culture/turn, and an impressive 18 gold/turn at this date. All of these were above the rest of the field of players, and the other civs were starting to take notice of the growing power of Singaboy. Japper was the player who was most interested in doing something about that, as he had declared war and decided to attack with his passing Viking longships. 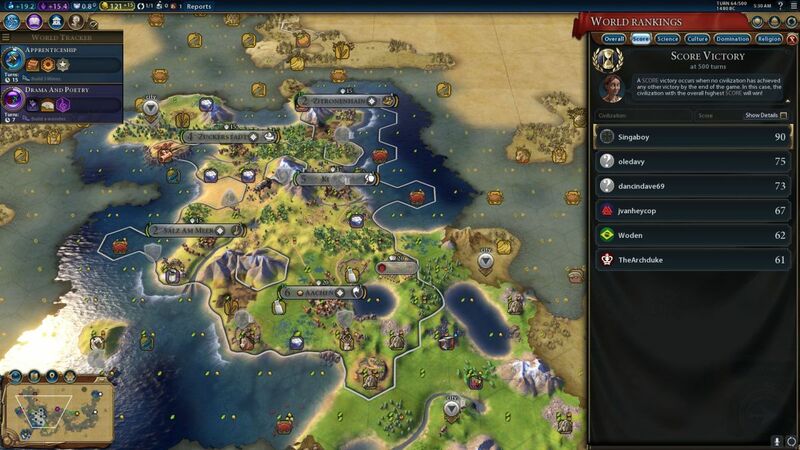 This wasn't intended to be a prelude to conquest, just a way to score some free gold and science via pillaging tile improvements and districts located along the coast. Singaboy had units on hand to defend, however, and was able to chase away the Norwegian units without any serious difficulties. This raises the question of what Japper had been up to, so let's back up for a moment and examine the Norwegian opening moves to reach this point. Japper opened with a fairly standard production order: slinger into builder. Then he chose to train a second slinger, perhaps due to his background on the MP ladder where nearly all of the games are tiny-sized Duel map pangaea starts where rushing the other player is the standard move. After the second slinger, Japper decided to pursue the first religion of the game by going for a fast Holy Site district, followed by producing a settler for a second city. This is indeed the kind of prioritization needed to get one of the first Great Prophets, but slowing down the growth curve by delaying the second city for so long was a questionable move in a game like this. The Holy Site completed on Turn 25 and Japper began a settler next, which took several turns to reach its destination in the south, finally getting established on Turn 36. 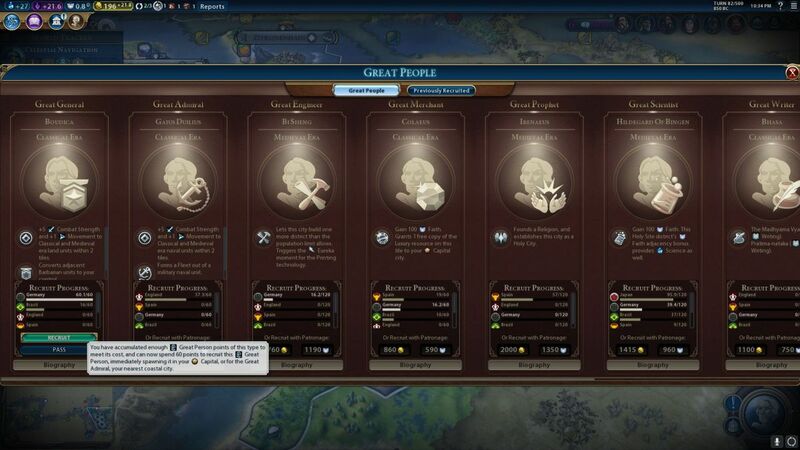 Unfortunately, Japper's low population and lack of any sources of culture was causing his civics research to lag badly; he was still only producing 2 culture/turn for his whole civ, and Craftsmanship civic didn't complete until the same Turn 36. That's a long time to be lacking the extremely helpful Agoge and Ilkum policies. Japper: Oledavy finished either two Holy Sites, a Holy Site and a Shrine, or is running the Wildcard that gives GP points. At this rate he'll still beat us to the first GP Time to put a stop to that. Desperate times, desperate measures... As it's turn 40, lets have a bit of an overall discussion on our progress. So far we have two cities, one district (a Holy Site with Shrine, thanks to Oledavy pressuring me), three tile improvements and a trader in terms of infrastructure. -I think kicking out the Holy Site so early was a mistake, I should've accepted being the second religion, it could've given me another settler and I'd be at three cities now or at least at two bigger ones. -We seriously lack culture income, I should've worked in a monument earlier, I just felt I didn't have the timespace to build it. Oledavy took two of the most powerful beliefs in Jesuit Education and Defender of the Faith. This would allow him to purchase Campus and Theatre district buildings with his faith income, along with making it very difficult to attack Japanese cities that had the Mormonism religion present. Throughout the game, other players would be hesitant to fight a battle anywhere in Japanese territory due to Defender of the Faith. As for Japper, he was the big loser in this whole process. When his own Great Prophet finally arrived on Turn 63, Norway ended up taking Feed the World and Wats for the two beliefs. Feed the World had limited use on this food-plentiful map, while Wats would take a long time to become helpful. Japper would need to construct more Holy Sites and then shrines and temples before he could plant Wats for the +2 science benefit, and even then the Wats themselves wouldn't be cheap to build. Oledavy had clearly gotten the better of the religious race. The naval raid that Japper launched against Singaboy had been the first conflict of the game. Another naval attack was impending though, this one an opportunistic strike from having ships in the right place at the right time. The target this time was Jester's Spanish civilization, so let's take a short look first at how Jester chose to play the opening moves. Jester began the game with a scout followed by a settler. The scout was a bit of an odd choice given that everyone knew this map would take place on an archipelago of some kind. While scouts can be a very useful opening build to defog more of the map, their usefulness was limited here given the smaller starting continents. This was also a capital that would have benefitted from an early builder, with the potential to gain +1 production from pastures on the sheep and cows, along with another +1 production from a stone quarry. Still, the extra income from working the truffles tile allowed Jester to purchase a second builder and he did get a second city planted very quickly on Turn 22. Snagging Goddess of the Harvest for Spain's pantheon was also a nice pickup for one of the later civs to choose a pantheon. The biggest problem for Jester was no obvious way to found a religion. 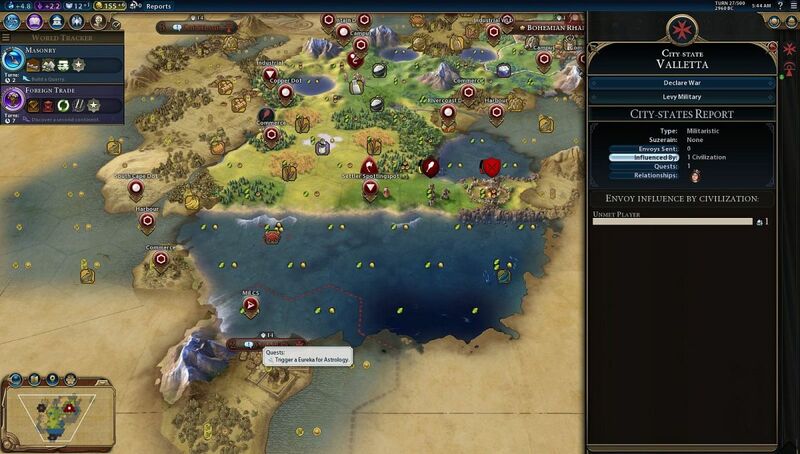 This is always a problem for Spain in Civ6, with their civ having several abilities related to religion and yet nothing to help found a religion in the first place. With oledavy and Japper pushing hard for their own religions, Jester's Spanish civilization was left out in the cold. When the initial two Great Prophets were taken, the third one leaped up in cost to 120 Great Prophet points and that meant a long haul indeed for Jester if he wanted his own faith. Stonehenge might have been a good choice here since it had never been claimed by anyone. Instead, Jester decided to work on Holy Site district projects in his third city, the only one with a Holy Site district, which was going to be a very long enterprise indeed. Jester also struggled badly to grow his cities to large sizes. 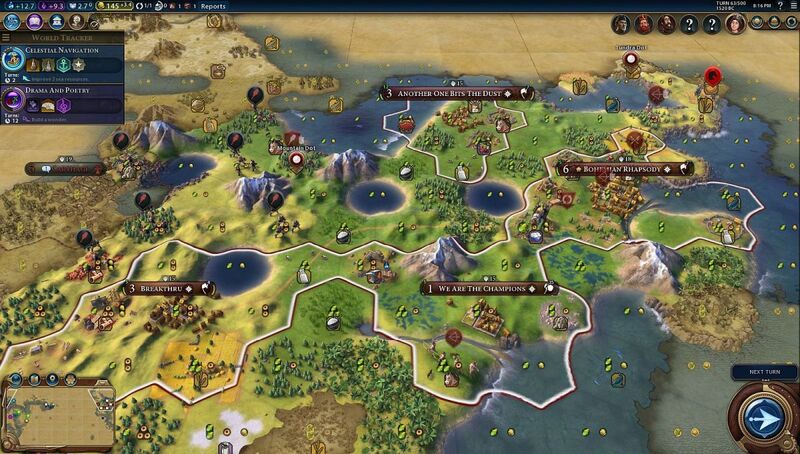 His home continent lacked a lot of high-food tiles for his cities to work, which meant that he needed to emphasize food output to keep pace with the other teams. This is one place where Feed the World would have been a pretty good choice for a religious belief. Instead, once his cities made it past the first few population sizes that need little food for growth, his cities began to stagnate in population. This was particularly acute at Ponce de Leon, which badly needed some imported sources of food from trade routes or granaries, and the non-freshwater city of Cordoba. This was not immediately apparent to the players in the game, since Jester's numbers looked good in comparison to the other teams. 13 beakers/turn, 10 culture, and 10 gold/turn were all very solid for this point in time. However, the stagnated situation of these cities was about to keep Jester in low gear while other teams began to accelerate past him. Pizarro was burned to the ground, leaving no opportunity for Jester to recapture it. Note the +5 strength on oledavy's ships due to the combat taking place in shallow waters. That was Japan's unique ability in action, and it would see a lot more use before this game was finished. Losing Pizarro was a devastating blow for Jester, with the Spanish growth curve fatally damaged. 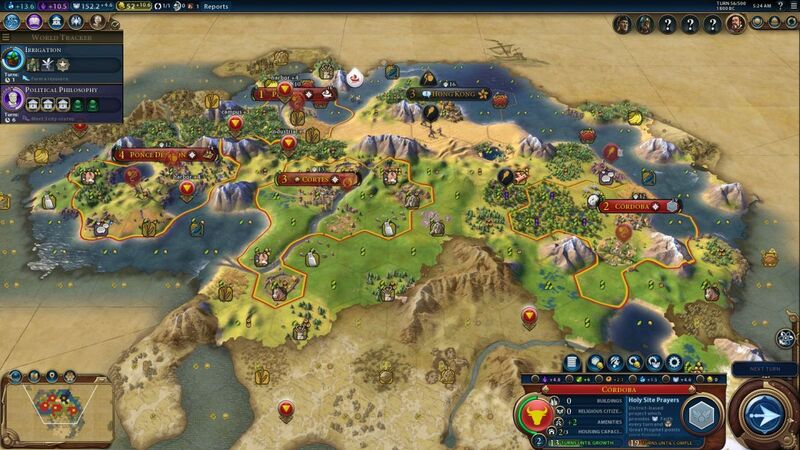 Losing a settler or a city is particularly harsh in Civ6 because the cost of each settler keeps scaling up; that is, the next settler is still 30 production more expensive than the previous one despite the loss. Jester would never fully recover from this setback. As for oledavy, he had dealt a major blow to his closest neighbor at the cost of making a permanent gamelong enemy. While Japper's raid against Singaboy had achieved little of consequence, this strike was one of the most important actions of the early game. This was the first time that Jesuit Education was leveraged, which oledavy used here to purchase a library. He would add more libraries at his other Campus districts and, eventually, faith-purchase universities as well. This allowed Japan to keep pace on science with some of the other players despite a rather slow opening in terms of expansion. Only having three cities on hand as late as Turn 63 wasn't exactly tearing things up in that regard. 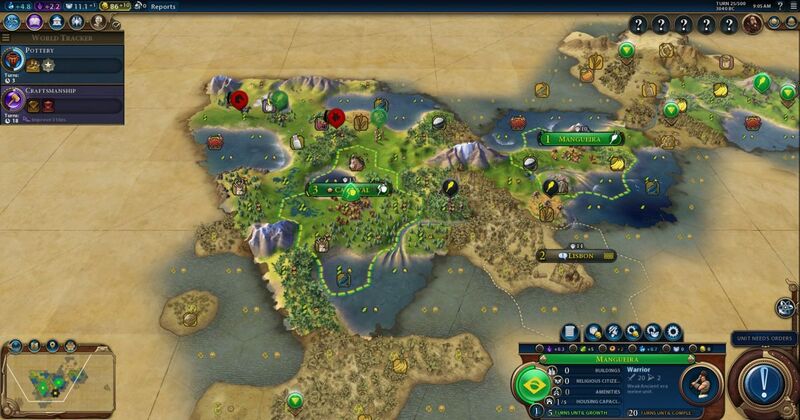 The early science leader was in fact Woden's Brazil, which had played an opening designed to maximize Brazil's rainforest bonuses. Woden opened the game with a slinger into a settler for a fast second city as several other players had done, then went back for a builder as his third choice in the capital. This was a solid decision as Woden didn't have much in the way of tiles that immediately required improving at his capital, just a horse resource that could use a pasture and nothing else. He had found a Commercial city state just to the east of his starting point, and the extra gold from the free envoy was a helpful boon in the opening turns. Unfortunately, most of that early edge went up in smoke when Woden was forced to purchase a warrior to defend against barbarian horsemen coming down from the northwest. Military units are one of the worst things to purchase in the early game because they get such a large production discount via Agoge policy. Still, sometimes you need a unit right now and those barbarian horsemen appearing was certainly a case of bad luck. Check out that science rate: 19 beakers/turn on Turn 51, wow! The Campus district at Mangueira was next to two mountains and three jungle tiles, for a total bonus of +5 beakers purely from adjacency bonuses. However, Woden's civ was highly unbalanced at this point. For all that he had that huge science rate, his culture rate lagged behind badly at less than 4 culture/turn. He had no monuments completed and no culture-boosting abilities or pantheon. As a result, a lot of the benefit of that science was being lost due to an inability to adopt more advanced policies. Woden was also in a bit of a stagnant position, a bit like Jester's Spain, and his overall growth curve had been slowed due to putting so many resources into those early Campus districts. Getting 19 beakers/turn on Turn 51 was amazing... but Woden was only getting 24 beakers/turn on Turn 66 and that was a lot less amazing. The explosive opening on scientific research was not sustained, with Woden needing to pause to build monuments and get more builders and military units out of his cities. In his defense, Brazil did benefit from excellent scouting and found many of the other players at an early date. Still, this unbalanced opening sequence delayed the discovery of Political Philosophy and the first governments until Turn 70, and that's a very long time indeed to be stuck on the initial two policy slots. Singaboy: Another statistic, the Great People overview. 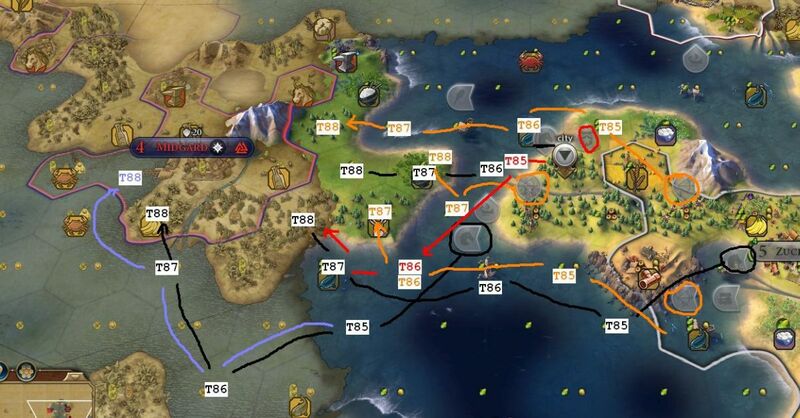 I will get the Great General in around 14 turns. This will be in line with my plans to attack Japper around turn 90. I have scouted his shores near my Island and feel confident to launch an attack from there. I doubt he can match my military strength. Currently, his military is really weak and he still has no harbors too. In 4 turns, he could start his shore bombardment again and it will be time by then to be ready to defend tiles at the coast. Germany would stop to build Hansas when Apprenticeship tech finished, but after that it was time to train more horsemen and upgrade warriors into swords. 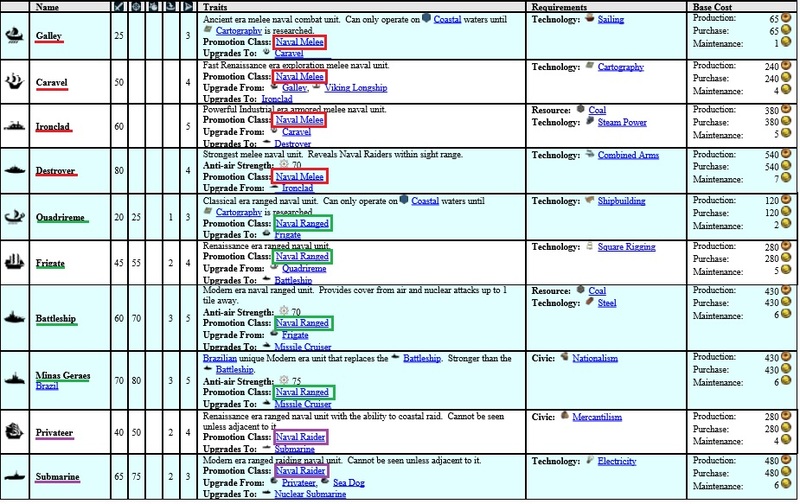 The game's first real war was in the planning stages. This would come as news to Germany's other neighbors and especially TheArchduke's England, who was located to the northeast of the German homeland. We'll finish this section by looking at the English opening to see where TheArchduke stood as the game launched into the first major conflict. 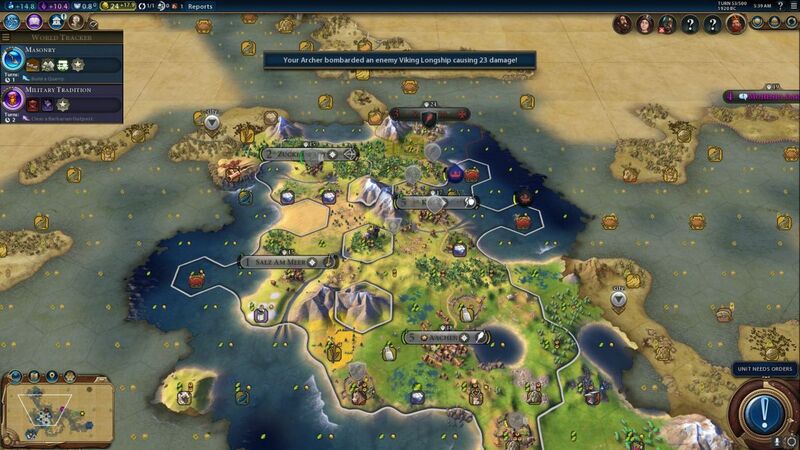 TheArchduke began his game by starting with a builder, the most economic opening possible. The builder was a good choice for this starting position with double stone, cattle, and wheat resources to improve, which together would unlock a whole bunch of tech/civic boosts. TheArchduke then followed up the builder with a slinger into a settler, therefore still starting out with the most common three initial units in a slightly different order. 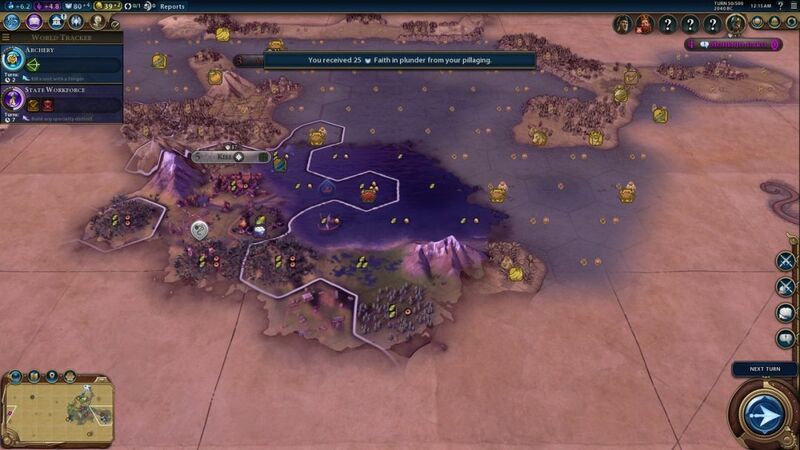 He was fortunate to have a Militaristic city state on his starting continent to accelerate the training of those units, and it was the best Militaristic city state in the base game of Civ6, Carthage. 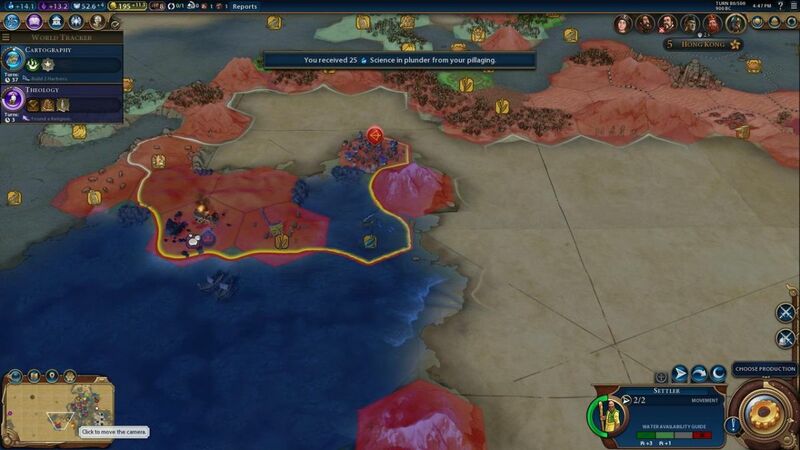 TheArchduke also made a bit of an odd decision in this game, choosing to delay the placement of his second city in order to move his settler down to the southern coast and get vision on a city state that he knew was across the water. 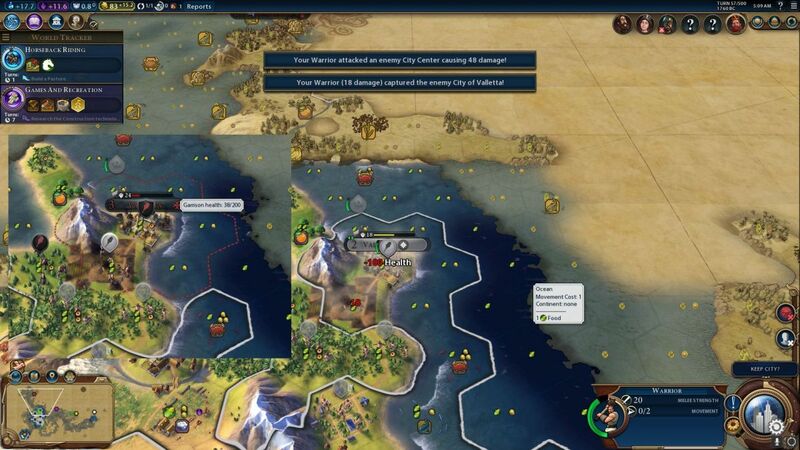 The meeting with Valetta is pictured above, and of course that was the same city state located on Singaboy's starting continent. England and Germany were fairly close together, separated only by that narrow body of coastal tiles. 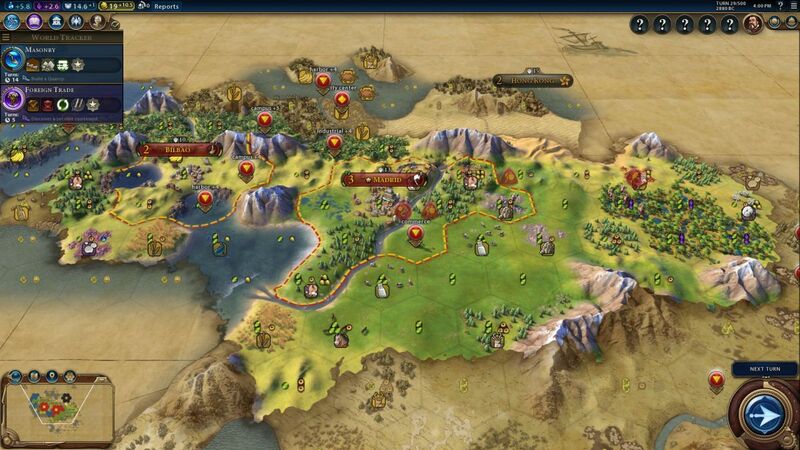 TheArchduke's second city would end up going on the "Copper Dot" tile indicated above, a low-food location not settled until Turn 33. Was it worth the delay in settling that city? Probably not, particularly since TheArchduke didn't get a free envoy with Valetta by virtue of Singaboy already meeting them. 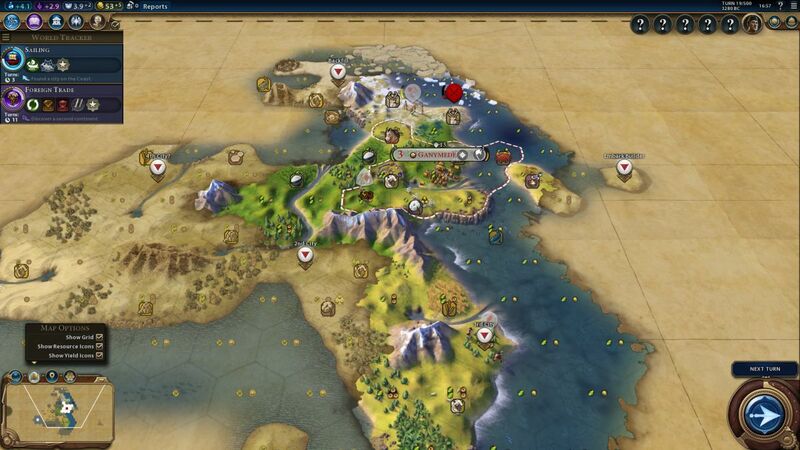 Just as in Civ4, it's usually not a good idea to delay settlers from reaching their intended spot and establishing a new city. TheArchduke: My reporting has been abysmal so far. Thankfully my economic catchup has not. Whilst I am still woefully behind Woden and Oledavy sciencewise, we will conquer Stockholm soonish (1 more warrior to Swordsman and then 2 quick quadriremes Great Admiral boosted (triremes are not, silly ancient era units..). Only with Triremes I fear those Archers will result in way too many casualties. We are at a hefty 50 gold per turn thanks to trade routes and harbours, something we are working to expand even further. We stand at 4 triremes and I plan to expand this to about 8 soonish. Also we are taking advantage of Mohenjo Daro to provide my waterless cities with pop. 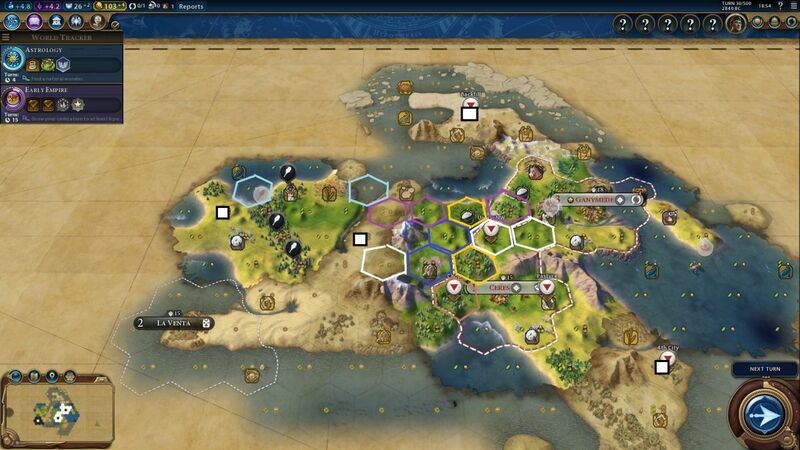 The next 2 settlers will be built by my capital and my lake city to keep our pop nicely maxed. 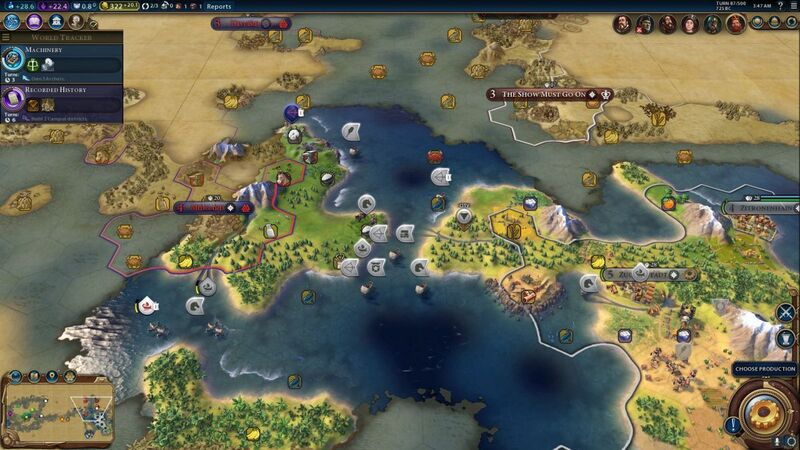 Check out that moneybags income at the top of the screenshot: 51 gold/turn and 6 available trade routes! TheArchduke's civ was on the rise, and his uncontested control over the early Great Admirals would grant him a huge advantage on this naval-heavy map. England was still in the process of internal development, but would soon be a force to reckon with down the road. oledavy: I actually forgot to mention, Singaboy got a GG [Great General] a few turns ago, and his power just jumped to well over 300 this turn.... And the Vikings have about 130 in military strength, the English aren't doing much better. It seems pretty clear to me where this is going. If Singaboy gets free cities, his already intimidating lead may grow unstoppable. With this in mind, it's now time to use the diplo thread to try to prompt people to action. On the one hand, I feel like the coming storm should be obvious to everyone, and I may be construed as insulting their intelligence by pointing it out. However, if there is even a chance my warning alerts Jpper007, Woden, or Archduke to the danger on their doorstep, it will be worth it. I fear I'm putting a target on my back by squawking loudly in the diplo thread. However, it is what the thread is for, and if my posts help alert other players to the threat he poses, it will have been worth it. At this point, if Singaboy doesn't simply win through his war with the Vikings, I think the endgame showdown will be between him and I. Woden and Archduke are hardly out of it either, though both are lagging in one notable way or another compared to me and the Germans. I think they're more likely to play a supporting role. Was Japper prepared for the assault? Would Singaboy's audacious gambit pay off? The Norwegian Campaign, and the first major conflict of PBEM4, were about to begin.